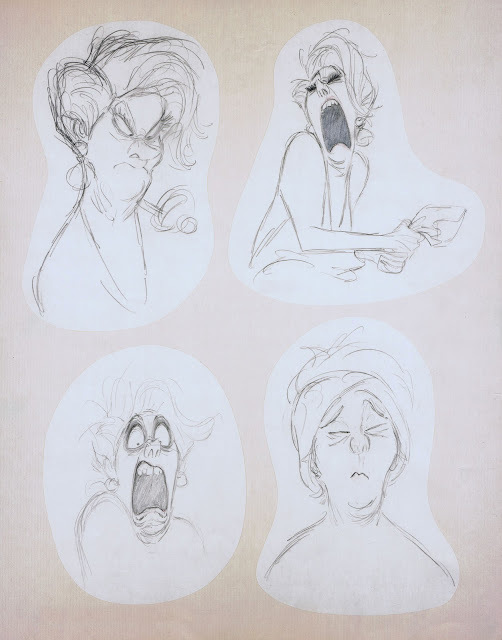 These are a few more of Milt Kahl's extraordinary roughs for Madame Medusa. It's the range of expression that floors me. Look at the mouth shapes, they can be small, almost minimal, or wide...and I mean WIDE open. Milt said in an interview:" I sometimes go very far with open mouth shapes, more than other animators. I guess, I am feeling something there...."
As a matter of fact, the mouth is open so wide, he almost breaks the jaw. or singing (especially opera), you find out these extremes exist in real life. Part of animating believable dialogue is to go this far OCCASIONALLY when a particular strong vowel calls for it. A character says :"How are you?". Which of the three words is emphasized? It could be either one. Listen to the track and decide . Go bigger on that one vowel. too broad, overdone and unnatural. On the other hand if you don't go broad once in a while, your animation will look bland and too understated. All this stuff comes with experience and developing an opinion about when a piece of dialogue looks and FEELS right in animation.